Online advertising is one of the most popular tools to drive traffic to your website and mobile application in a consistent and cost-effective manner. Online text ads play a very big role in this strategy. Building an effective ad campaign usually involves the write-up of different textual content to perfectly target your audience based on their currently viewed content (or search keywords), demography, and other relevant metrics. For textual ads, the marketing expert can use existing online tools to create and maintain many different ads and experiment with different wordings to optimize the expected conversion rates. But what about image ads and ad banners? This is a completely different challenge. First, you need your graphic designer to prepare a nice looking graphical ad banner concept. 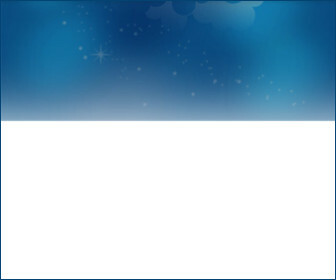 The concept should then be extended for the different banner dimensions and aspect ratios required. For example, in Google's ad network, you can create up to 12 different-sized banners: rectangle, square, skyscraper and others. After having all the different banner templates in place, you'll want to create multiple versions of each template using different wording, labels and possibly different graphical elements. But that's not the end of it. After launching your campaign, you'll probably want to continue modifying the texts, colors and sizes of your ad elements. You might want to do that in an A/B testing environment to make sure you have a positive impact on your campaigns. Requesting the graphic designer to create new banners for every text change is very tedious. With just 12 different banner dimensions, 10 campaign wordings with 2 text variations in each one, you're left with 240 different images! As it happens, Cloudinary is an online image management solution that offers many interesting features, covering aspects of image uploads, storage, administration, manipulation and delivery. Cloudinary is also capable of powerful, on-the-fly image generations and transformations. So when we wanted to create a banner ad campaign experiment for Cloudinary, we realized that we can use Cloudinary itself to dynamically create as many image banners as we wanted, dynamically modify texts, colors and layouts and easily tweak them for our A/B testing needs. 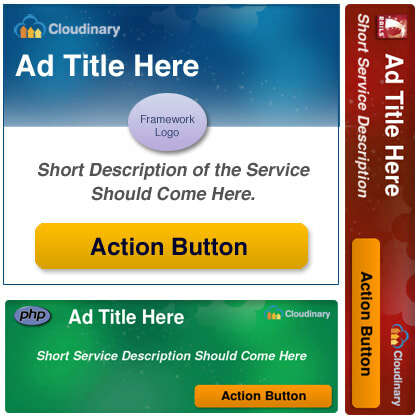 We wanted to share this experience with you and describe how you too can build image ads dynamically using Cloudinary. Then we used Cloudinary's API to create 3 different text styles (title, description and button). See this blog post for more details about text layers. For example, the following Ruby command creates a text style for the action button. It is a 24 pixels Helvetica Bold font, and it assigned with the public ID of 'helv_bd_24_black'. Now that we have all building blocks ready, we can quite easily use Cloudinary's URL-based transformations and overlays to generate the actual image ad. The next step is to embed the text layers using the three text styles we've prepared earlier. We'll accomplish that using Cloudinary's powerful dynamic transformation URLs that allows us to easily embedding text overlays in image (URI encoded). But now we also want to create a 250x250 Square. This requires changing the layout, size and positions of the graphical elements. And now for our final challenge - creating a 728×90 Leaderboard Banner. This requires a different layout. While we can reuse most of our existing building blocks, we did uploaded a wider blue background for this new layout. So far we've shown how to use Cloudinary's cloud-based image transformations and overlays to generate different-sized banners that share the same building blocks and text. But what if you want use a single banner but with different versions targeting a different audience? (in our example, Rails instead of PHP developers). To accomplish that, you can simply modify the long transformation URL either manually or using any of our client libraries (Rails, PHP, jQuery, Node.js, .Net, Java, iOS, Android and others). For example, the image below is generated by applying a red 'hue' effect to change the ad colors from PHP blues to Rails reds without uploading a new red background. The same goes for the different shades of the action button. After deploying your ad campaigns and determining their effectiveness, you'll probably want to tweak the textual content to try and improve your click conversion rates. Thankfully, since you've decided to use a dynamic method for generating your banners, you no longer need to manually edit dozens of images and update their textual content one at a time. Instead, you can simply update your Cloudinary URLs with the updated texts or possibly let your campaign manager do it himself. Isn't that cool? Easily create image ads and banners of any dimension. Quickly change look & feel, and color scheme. Modify texts and performing layout and content A/B experiments without involving a graphic designer or performing tedious manual editing. Treat your images in the same way you treat your dynamic code modules. And as the sample banners says, it's 100% cloud based, so you don't need to install any image editing or processing software on your side. 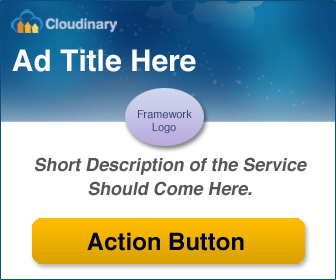 The capabilities required for creating the dynamic image banners described in this blog post are available with any of Cloudinary's free and paid plans. Create your free acount.